Do you love also the TV experience with Ambilight (from the company Philips), that creates light effects around the television that correspond to the video content. But this is now also available for in your favorite web browser! 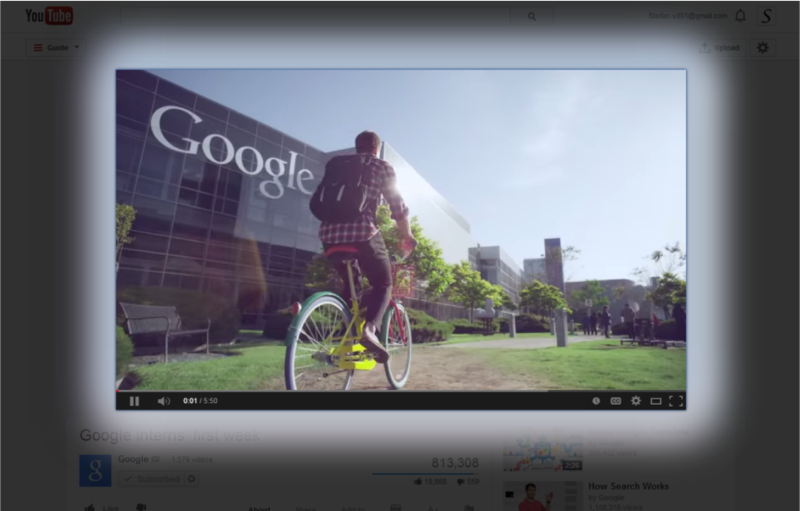 This new feature generates light effects around the video frame that correspond to the online video content. And it shows the effect only when you click on the play button on that video player (example this on YouTube or on a HTML5 video from any website). In the Turn Off the Lights options page you can easily change the mix of colors. The Atmosphere Lighting feature can you choose between 'one solid', 'four solid' or the 'real colors' effect with the vivid mode. The one solid color effect is the best solution for making the video more enjoyable. Here in picture 1 you see the cyan blue atmosphere lighting effect around the YouTube video player. The effect is only visible when the video is playing, when you click on the pause button or the video is just ended. It slowly decreases the value of the spread and blur to the value zero. The smooth transition makes the lights glow go out, just like doing the lights self off in your bedroom. The enchantment you see here it's a lot's beautiful than the traditional YouTube videos. Sometime you want to make the video player more playful and beautiful, so here with this option you can choose self the four colors around the video player. And choose self between a wide of range of colors, from blue, green, yellow, red, pink, black and white. You can customize up to the four border of the video player. 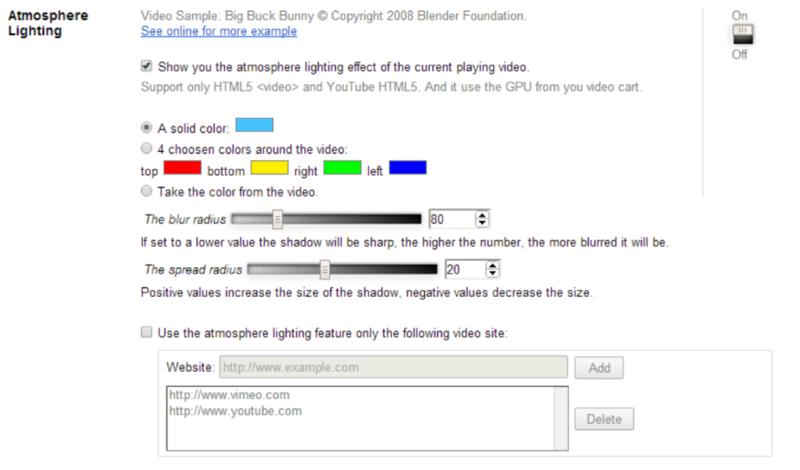 This works for YouTube videos and as well as regular HTML5 videos on the internet. What is really amazing is to see the real colors of the video content self. And that is also possible thanks to this feature in the Turn Off the Lights browser extension. It's the only browser extension that have this amazing feature, and show it also correct to the user. So it's a unique feature where you are the first user on the front row, that help makes your YouTube video more enjoyable. Here's another example where you see the real colors from the video content self. This is a video from Google on the YouTube channel. See how the beautiful colors reach out the video player frame. This makes watching a video online so much enjoyable even if it's a shorter length of the video. 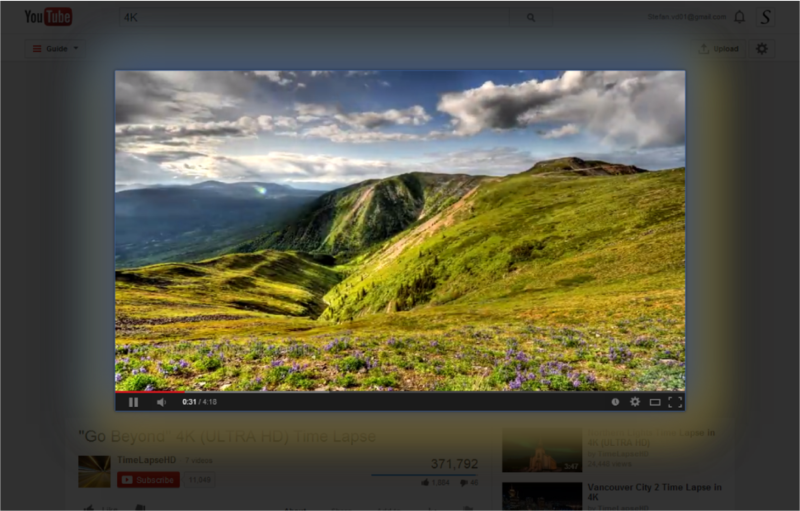 Currently this feature work great on all the HTML5 and YouTube videos. To see a real example of Atmosphere Lighting, turn the option on in the Turn Off the Lights options page. Navigate to the Turn Off the Lights options page from the extension overview page, and than click on the link "Options". It's open automatic a new web page, when the page is finished with loading click on the tab "Visual Effects". And now on this page you can enable the atmosphere lighting feature in your browser. The Atmosphere Lighting feature got three various options. left of this option you can choose self the color you want to see around the whole video. Below you you can choose self four own colors by the color picker. This option will detect the four colors from the video and show it around the video. If set to a lower value the shadow will be sharp, the higher the number, the more blurred it will be. Positive values increase the size of the shadow, negative values decrease the size. When you enable the vivid effect in the Turn Off the Lights options page, all the YouTube (HTML5 Player) will show you are more beautiful and vivid effect. This increase you comfortability and joy to watch this video. It's like the colors coming outside the YouTube video screen. Are you blows away of this amazing feature, we do. Test self the Atmosphere Lighting feature in the Turn Off the Lights extension or the Aurora Player app, it's available for all browsers. Download it now for your browser. Note: Ambilight is a trademark of Philips. Use of this trademark is subject to Philips Permissions.